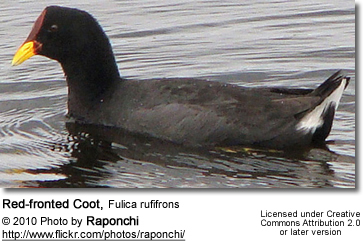 The Red-fronted Coot (Fulica rufifrons) is a South American rail found in Argentina, southern Brazil, Chile (north of Santiago to Puerto Montt), Paraguay, southern Peru and Uruguay. There are also some records from Bolivia and the Falkland Islands. 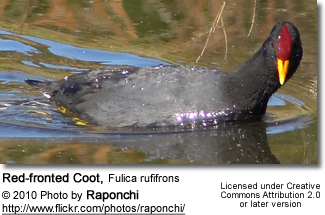 They are found in swamps, marshes, as well as well-vegetated lakes and ponds. 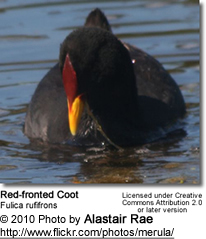 They are named after their deep-red frontal shield that is right above the yellow bill. They have white undertail feathers (please refer to the photo below).